The Vivian Olum Child Development Center uses an annual enrollment model based on the school year which begins September 1. Because we value developing and maintaining relationships among children and caregivers, we keep each classroom of children together as a cohort for the entire year, allowing teachers and children to fully develop their relationships. At the time of enrollment, we look at the child’s age as of September 1 to determine classroom eligibility. If new children are added to the classroom mid-year, we will strive to keep age range within 12 months of all of our classrooms except the school age classroom. 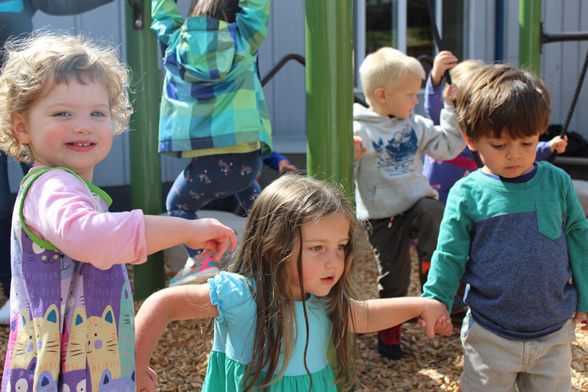 Once a child is enrolled in the program, UO-affiliated staff and faculty families are guaranteed ongoing enrollment from year to year based on the child’s current schedule. Student families are guaranteed ongoing enrollment until the end of the current academic year.